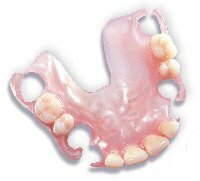 A denture is a removable item that is constructed to replace one or more missing teeth. An acrylic framework fits in the area between the existing natural teeth and carries false teeth, which then fill the gaps in the dentition. 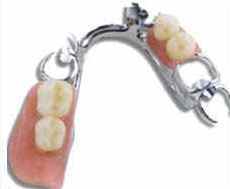 A better partial denture is the Metal Frame Denture. This is a precision fit of denture. The metal is a silver colour and usually made of chrome-cobalt. It is very important that all the teeth in an arch are restored before a metal denture is fabricated. The reason is that the denture is made to fit exactly against the existing teeth. If the form of a tooth is altered after the denture is made, chances are that the denture will not fit snugly against the existing teeth anymore. Dentures are not the ideal answer to replacing missing teeth and very often patients expect too much. It can be compared to crutches for someone who had lost a leg. It will take a while to learn how to use them, but one can never expect to function in the same way than with natural teeth. Many patients are more than happy with their dentures and don't want anything else. The resin that your denture is made from has microscopic holes that can collect food debris and bacteria. Dentures become contaminated, because they are in your mouth on a daily basis and sometimes worn 24 hours a day. Soak your denture in 50% water / 50% vinegar to inhibit fungus growth. A better alternative is Aloe Vera gel that is placed in the denture once a day. Aloe Vera is a good anti-fungal.